While 3D stereo images were understood and enjoyed long before the invention of photography, they became wildly popular in the late 1800’s when photography became more widespread. One of the most popular ways to view stereo images was with a handheld viewer, such as this “Holmes-type” stereoscope, developed by Oliver Wendell Holmes (1809-1894) in 1861. 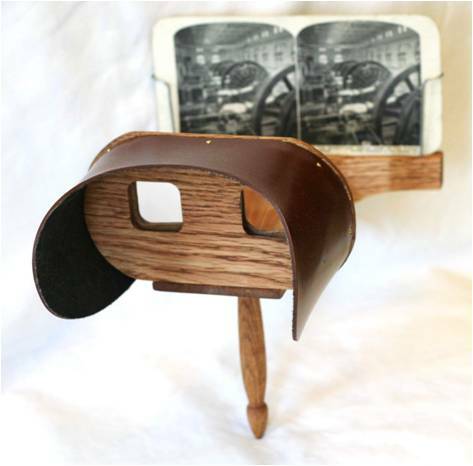 A Reproduction Holmes-Type Stereoscope. Wikimedia Commons. Accessed: 22 July 2010.